The United States wants to withdraw a third of its 37,000 troops stationed in South Korea by the end of next year, a Foreign Ministry official said Monday as the two countries discussed U.S. plans for repositioning soldiers along the Cold War's last frontier. The withdrawal would be the first major troop cut on the Korean Peninsula since the early 1990s, when about 7,000 U.S. soldiers were withdrawn. The U.S. request came Sunday evening as both sides prepared to open the two-day Future of the Alliance talks, said Kim Sook, head of the South Korean Foreign Ministry's North American bureau. The U.S. delegation, led by Assistant Secretary of Defense Richard Lawless, said Washington wanted to withdraw some 12,500 U.S. troops by December 2005, Kim said. The figure would include about 3,600 already slated to be redeployed this summer from South Korea to Iraq, Kim said. The talks follow a shift in Seoul toward a more liberal government following recent elections. They also come amid the continuing dispute over North Korea's nuclear weapons development. Kim said officials at the South Korean National Security Council, Defense Ministry and Foreign Ministry would review the proposal before giving a response: "We'll formulate a position and then notify the United States." He said the issue was unlikely to be discussed again during the talks, which end Tuesday. The talks are supposed to focus on a separate plan to move U.S. troops farther south, away from the Demilitarized Zone between North and South Korea. About 7,000 U.S. forces and their families would also move from the sprawling Yongsan Base in downtown Seoul to an expanded facility south of the capital by 2006. 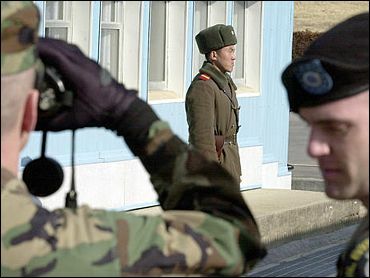 Washington has kept troops here since the Korean War, in part to help Seoul deter potential aggression from the North. The Korean War ended without a peace treaty, and the two sides are still technically at war. Troop levels are a prickly issue in South Korea, where many still have painful memories of the communist North Korean invasion that triggered the 1950-53 war. South Korea fears the move will expose Seoul to North Korean attacks if the U.S. ever stages a pre-emptive strike on North Korea's nuclear facilities, reports CBS Newsman Don Kirk. The country's Yonhap news agency quoted an unnamed South Korean official as saying South Korea proposed that the pullout happen gradually through 2013. South Korea announced last week that the United States had floated the idea of a major troop withdrawal from the Peninsula, but officials did not indicate a timeline for the pullout. The proposed changes — along with anti-American sentiment among many young South Koreans — has triggered concern among some that liberal President Roh Moo-hyun, who recently won a majority in parliament, may be endangering his country's alliance with the United States. Roh has said his country should assume a greater role in its own defense, but on Sunday he pledged his government would continue to "properly nurture the South Korea-U.S. alliance." "The concepts of self defense and an alliance can complement each other," he said in a nationally televised speech marking the country's Memorial Day for the war dead. The planned U.S. troop reduction is seen as part of Washington's global effort to realign its forces so they can better respond to emergencies worldwide. Although the number of U.S. troops in South Korea will decrease, Washington says the allies' defense capabilities will not weaken and has promised to spend $11 billion in the next five years to upgrade its military firepower in the theater.